We’d barely left New Jersey when I spotted an unusual highway sign with a dotted image that resembled the children’s game connect the dots. 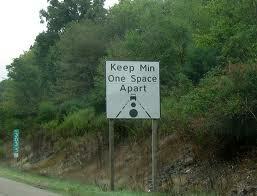 The sign said, Keep Min One Space Apart. A series of equally spaced elliptical white dots marked the center of the road in front of me. I sped over them, not sure what to make of the painted ovals. It looked like a giant game of Road Twister for bored travelers. I was waiting for the next signs to say, Left Tire, Green and Right Fender, Red. We finally pulled up to camp—in a downpour. By the time I unloaded the car my clothes were completely soaked. I gave my daughter a wet hug and raced home, eager for this adventure to end. That’s bizarre! If you hadn’t been cranking that rowdy NPR, maybe you could have payed more attention to the road. You know it. “All things considered” gets me so fired up! As if driving a U-Haul that distance weren’t stressful enough! I can relate to your dread about driving great distances into the unknown. BTW, I was born in Pennsylvania and can attest to what your hubby said, they do speak English there. Great lines and story, Lisa. As for the ‘one space min,” my policy is to be able to see the rear tires of the vehicle ahead of me. I hate it when I see someone behind me who is so close that I can’t even see their headlights. If I had to stop suddenly, that driver would slam into the trunk of my car. Thanks, Judy. I remember that “see the rear tires” trick from driver’s ed and still use it today! Great! Then, I’ll feel quite comfortable should I ever see your smiling face in my rear view mirror. What a story! I’m still cracking up from your first line. It’s comments like yours that make blogging so much fun. ROFL! You can get a ticket for tailgating?!?! Who knew…great post! I want to go on a road trip now to see those dots. I’ve not seen them when I cross the border on my way to Philly. I wonder if it is a regional specialty of the Poconos. The one upside to this is that you had already dropped off your daughter and her friends. You would have never heard the end of it if they were in the car with you. You’re right, I’d never hear the end of it. A friend of mine was recently pulled over for using her cellphone. I saw her get the ticket and mentioned it to her daughter the next day. It turns out she was trying to keep it a secret from her daughter and I spilled the beans. Now I’m the one not hearing the end of it! So funny! I’m glad I found your blog. Your writing is great. Hope he didn’t make it an expensive violation. I had never seen one before either. Hopefully others can learn from my mistakes! I think those Pennsylvania treasury people put up those white dots to catch unsuspecting New Jersey drivers on their way to or from summer camps. Right, just so NJ can get a bad rap about yet one more thing. Count yourself lucky you didn’t get tased. I am so disappointed to learn you’re a tailgater. Everyday I got some WOMAN on my rear with her grille up my trailer hitch on the cell phone while applying makeup. Other than that, I think you’re okay. “grille up my trailer hitch” Too funny, Ron. I live in the suburbs. I don’t even know anyone with a trailer hitch. Oh my GOSH I wish you could get ticketed for that in Michigan. Tailgating, I mean, not wet t-shirts or listening to NPR. If my kids could, they would ticket me for listening to NPR. Oh, I’ve seen similar signs before but I didn’t realize this meant the cops are sitting around, waiting to nail drivers. Good to know. I bet your husband won’t ever hear the end of this one, for him leaving you in the wild to fend for yourself! I really have to learn to interpret the signs. (A metaphor for life). This blog post was right on time for me. The Universe is good and I needed to read this. I’m about to embark on an adventure with my three kids, alone, without a man around, this weekend. By choice. I need to do this for myself. Being a single mom now, it’s about time I leave suburbia and gain a little independence. And so I’m choosing to go tent camping out in the wilderness to bond with the bears. Yes, I’m crazy, but if I can make it through without my damn Facebook, hairdryer and 3 showers per day, I can do anything. I will be sure to wear a white t-shirt and wet myself down before I take off in my rock star minivan. A girl’s gotta do whatever she can to get out of a ticket. If my kids ask me what the hell I’m doing that for, I’ll just tell ’em that I’m attempting to increase my chances at winning the 2012 Mom-of-the-Year award. Wow, you’re right, that post was timely for you! I admire your spirit! It’s good to break out of status quo sometimes and push your limits. I bet it will be a memorable trip for all of you. Good luck on your daring, Facebook-free adventure! Hahaha! Hey, didn’t you know? Pennsylvania=Afghanistan. Lol’d at your fear of road kill. Can’t say anything, though I’m a country girl, the feelings you describe are those I felt the first time I drove into my job in downtown Columbus. On our recent trip to Arkansas my kids were intrigued by the new and unfamiliar roadkill, armadillo — looked like dead rats wearing armor. ewww. I’ve traveled in many states and I’ve never seen the dots on the highway before. And I definitely would have missed the significance as I too was grooving to NPR. And when I’m out on my bike – I get to see all of it right up close. See what you miss by living in the city? Sounds like when you ride your bike you have to look out for more than cars and pedestrians! What?? Oh, sorry, maybe it’s “Kokomo”. I’m with you on the “Don’t Tailgate!” sign. So much easier to understand. Poconos, kokomo, shmokomo, it’s all the same . . .
My first visit and delighted. You write so well – enjoyed your adventure spiced with humor. I am delighted that you are delighted! 🙂 Welcome! As soon as you mentioned the white dots, I knew what you were talking about. I was a long haul trucker for a few years and have been to all of the 48 contiguous states except for the five most northeastern ones. I remember those dots well! I find driving and travel relaxing and enjoyable, unless I’m in a car full of teenagers with the radio cranked up. And even with all my driving experience, I still don’t care to steer with my knees, so color me impressed. Perhaps, though, to reassure the drivers of passing semis going three thousand miles an hour (because if they can, they do) you might consider investing in earplugs? See, when truck drivers see car drivers doing “dangerous” things (forget that driving three thousand miles an hour might be considered dangerous), first thing they do is get on the CB radio and start gossiping, er, warning the other drivers of the “idiot driving with her knees” in the car. Then the other truck drivers know to run you down, er, avoid you like the plague. Or I could get a CB radio and they can tell me I’m an idiot directly. Holly, I would love to hear more about your job as a long haul trucker. You must have some wild stories. Have you written anything about it? Not too much. I keep telling myself that I will someday. But I never get around to it. I really need to!